My Pinterest account is a few months old, but I'm never on the site. The last thing I need is another Web-based addiction. However, several of my coworkers talk about Pinterest quite a lot, and I had some free time last week. Yep. I got sucked in. Most of the pins on my page are food or fashion, big surprise. Apparently gradient nails are kind of a "thing" right now, done in glitter or just polish. I tried my hand at the trend with purple/silver glitter over black nail polish for bout day. The purple and silver together from a distance look rather pink, but otherwise I'm going to call this a success. If you're interested, this is two coats of black nail polish. 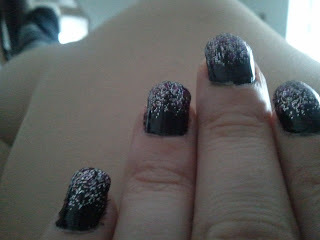 Over that, I kept layering glitter, starting with 2/3 of my nail, then 1/2, then 1/3, and so on. Surprisingly easy! A quick-dry top coat helped this from getting too smudgy afterward, too.